Where are the world’s nuclear weapons and who do they protect? 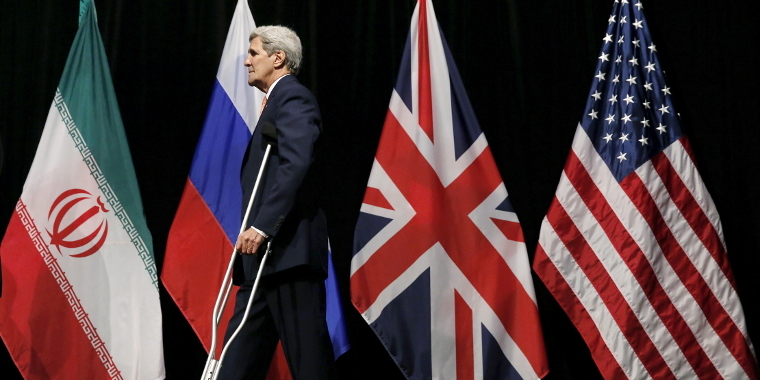 U.S. Secretary of State John Kerry leaves the stage at the Vienna International Center in Vienna, Austria on July 14, 2015 during talks in which Iran and six major world powers reached a nuclear deal. We can think of the nuclear world as a map of where all the nuclear weapons in existence are located. The maps looks the way it does because of two powerful yet competing goals. On the one hand, the majority of countries support a nuclear weapons–free world; this support has resulted in nuclear weapons being banned in areas on the earth and beyond. On the other hand, because of the security, prestige, and power associated with the possession of nuclear weapons, a small number of countries still possess nuclear arsenals, and that number has increased over the past seventy years. Although the number of nuclear weapons in the world has shrunk since its peak in the 1980s, more countries now have nuclear weapons. Nine countries are known or believed to possess nuclear weapons: China, France, India, Israel, North Korea, Pakistan, Russia, the United Kingdom, and the United States. These are called nuclear weapons states. Several other countries started nuclear weapons programs but gave them up, either voluntarily or because of pressure from other countries. A few have had nuclear weapons and later destroyed them or turned them over to another nuclear weapons state. Because countries do not reveal their military secrets, knowing exactly how many nuclear weapons each country possesses is difficult. However, all countries experience some level of security leaks, and a few decades of careful research has produced a generally accurate picture of nuclear arsenals globally. 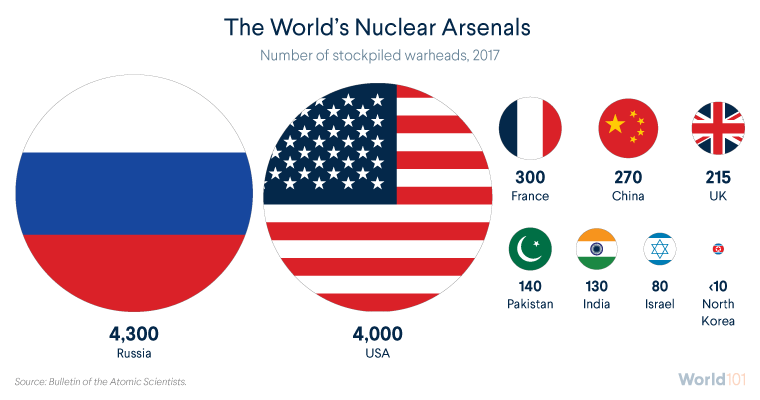 Approximately 93 percent of all nuclear warheads, or individual weapons, belong to the United States and Russia combined, each having roughly four thousand in its stockpiles. During the Cold War, the United States and the Soviet Union together amassed some sixty thousand weapons. Nuclear annihilation was a persistent threat, because each country possessed enough nuclear weapons to destroy the other several times over. Though the threat of a nuclear war is less immediate now than it was during the Cold War, it has not disappeared. As the number of countries that possess nuclear weapons grows, so does the potential for catastrophic conflict. Nuclear conflict involving any of the five original nuclear powers—China, France, Russia, the United Kingdom, and the United States—is unlikely but remains a possibility. Although the number of weapons held by these countries has declined, most are reluctant to pursue complete disarmament because they see nuclear weapons as important components of their security posture. After all, nuclear weapons are the most powerful weapons ever created and few countries want to give them up. In addition to these five countries, four other countries acquired nuclear weapons around the time of, or after the Nuclear Nonproliferation Treaty (NPT) went into effect. Though Israel has never confirmed its status as a nuclear weapons state, it is believed to possess a considerable number of nuclear weapons. It never joined the NPT, the major treaty trying to halt the spread of nuclear weapons, but it has taken action to stop nearby countries from building a nuclear arsenal. Israel bombed suspected nuclear reactor sites in Iraq (1981) and Syria (2007). It has also signaled that it would attack Iran if it feels threatened by the country’s nuclear program. A 2015 deal between Iran and China, France, Germany, Russia, the United Kingdom, the United States, and the European Union, limited Iran’s nuclear development and eased some international tension. However, in 2018, the United States alone withdrew from the agreement and reinstated sanctions against Iran, though the other parties involved have stuck to the agreement so far. Sharing an 1,800-mile border, India and Pakistan have fought several conventional wars over one hundred thousand square miles of disputed territory. Both countries possess nuclear weapons. Neither joined the NPT, and both appear to be modernizing and adding to their stockpiles. Many policymakers and experts fear that nuclear war could break out between the two countries—or, even more concerning, that Pakistan could lose control of a nuclear weapon to terrorists. Although North Korea is believed to have a small arsenal, its continued nuclear tests have raised widespread concerns over possible nuclear conflict. It withdrew from the NPT in 2003 and conducted its first nuclear test in 2006. Since then, it has threatened to use its nuclear weapons against the United States, Japan, and South Korea. The nuclear world isn’t just where nuclear weapons exist. Since the 1960s, some countries have come together to create nuclear-weapon-free zones (NWFZs), specified areas where countries pledge not to build, receive, test, or store nuclear weapons. NWFZs do not prevent the use of nuclear technology for peaceful purposes. The idea of setting up an area where nuclear weapons are banned was introduced in 1958, when Poland suggested a plan to get rid of nuclear weapons and create a nuclear-weapon-free zone in Central Europe. But NWFZs officially got their start through the NPT, which recognized the right of countries to make these zones (as twenty-one Latin American countries did in the Treaty of Tlatelolco in 1967). There are five treaties that have created NWFZs in Africa, Central Asia, Latin America, Southeast Asia, and the South Pacific. Together, these zones cover 115 countries, spanning the entire Southern Hemisphere and parts of the Northern Hemisphere. 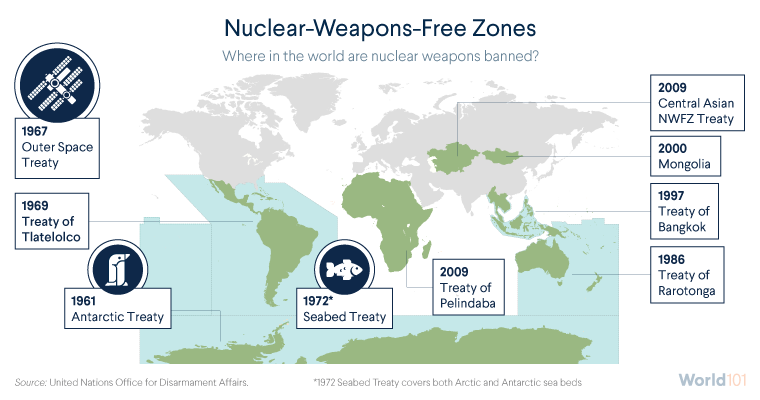 The Seabed Treaty bans weapons of mass destruction on the ocean floor. The Antarctic Treaty bans any military activity in Antarctica, including the testing of nuclear weapons. The Outer Space Treaty bans weapons of mass destruction from the earth’s orbit, the moon, or any other object in outer space. But the global divide isn’t as simple as nuclear and nuclear free. Many countries without nuclear weapons want to protect themselves against nuclear threats without developing nuclear weapons themselves. One way to do this is through a security guarantee, a pledge from a country to protect an ally using military means. A security guarantee extends the perceived security a nuclear arsenal provides to allied countries that do not possess nuclear weapons. Because of this provision, a security guarantee provided by a nuclear-armed country is also called a nuclear umbrella. The U.S. nuclear umbrella covers several countries. North Atlantic Treaty Organization (NATO) members: NATO member countries that do not have nuclear weapons (two other NATO members, France and the United Kingdom, have nuclear weapons). Japan: In 1951, at the end of the Allied occupation, the United States and Japan signed a security treaty that provisionally allowed the United States to maintain armed forces in and around Japan. In 1960, the two countries revised this agreement, which then allowed the United States to set up military bases in Japanese territories in exchange for U.S. protection and security, including nuclear weapons. Australia: Since 1951, the United States and Australia have been part of a collective security alliance, but the related treaty is nonbinding and its language not as strong as that in the North Atlantic Treaty: whether the alliance requires the U.S. military to actually come to Australia’s defense is unclear. Still, most experts consider Australia to be protected by the U.S. nuclear umbrella. South Korea: Two months after fighting stopped in the Korean War in 1953, the United States and South Korea signed a mutual defense treaty creating a military alliance that continues to this day. Interestingly, a nuclear umbrella is also meant to be a tool of nonproliferation: if countries without nuclear weapons are protected under a security guarantee from a nuclear-armed country, then those countries will be less inclined to start nuclear weapons programs of their own. 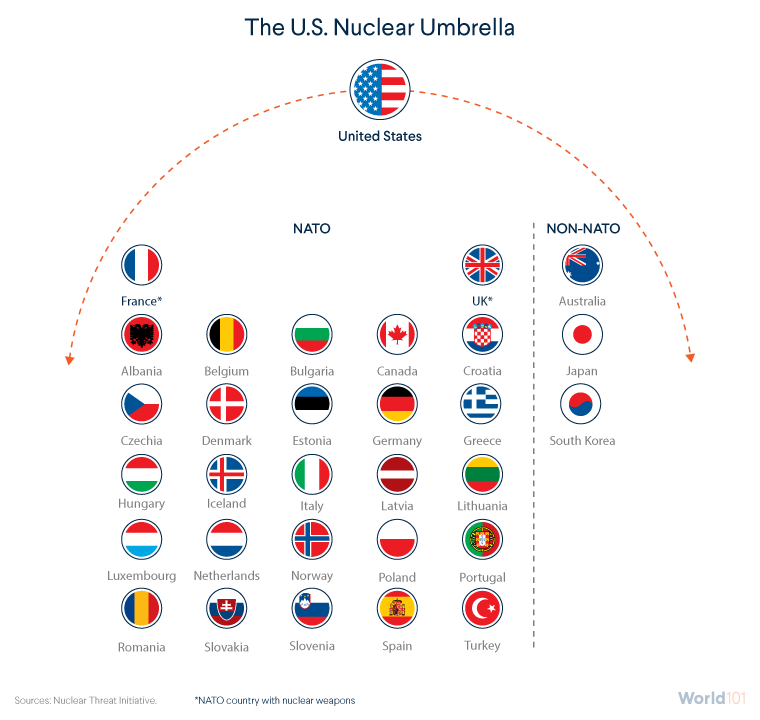 Security guarantees and nuclear umbrellas both illustrate an important point: even countries that have committed to nonproliferation understand that they live in a nuclear world. The different ways in which countries deal with that reality—acquiring nuclear weapons, declaring NWFZs, or seeking security guarantees—reflect the paradoxical goal most countries are trying to achieve: a peaceful future secured by weapons as necessary.